Now in its second year the Mobile Safari — a one-day, invite-only excursion to the headquarters of mobile-first companies — was a stand-out success, offering a select group of businesses and brands the unique opportunity to learn valuable practices first-hand from the experts behind them. The event, this year organized by the MMA Germany in partnership with the OWM, the voice of German advertisers and the representative body of members across all areas of marketing communication, provided participants the rare and exclusive opportunity to connect with the companies harnessing mobile to transform marketing, advertising, commerce, communications, banking, publishing, adtech and the enterprise. We kicked off the Berlin Mobile Safari with breakfast at the renowned Journalisten Club at the Axel Springer high-rise with a great view over the city. After a great breakfast and a welcome chance for a little sightseeing the Safari moved to its first destination. 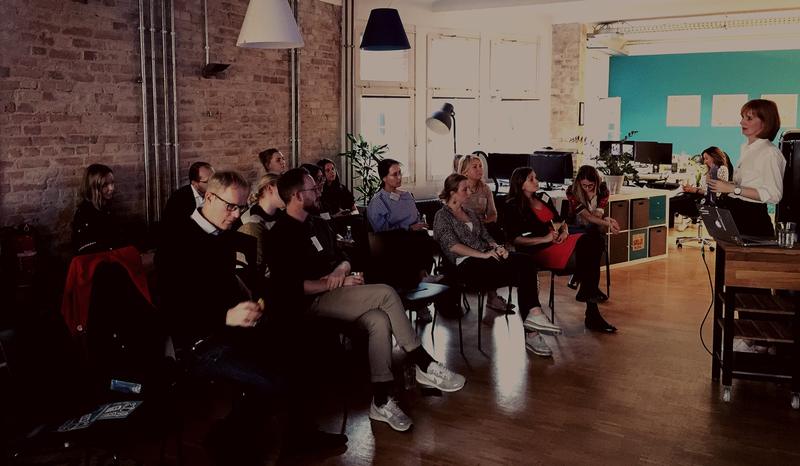 Our group was treated to a talk from upday for Samsung, Europe’s leading content aggregation app. There upday Director of Advertising Aneta Nowobilska discussed new opportunities and challenges in app marketing and monetization strategies and shared invaluable insights. Next stop on the tour was the office of Kitchen Stories in the pulsating heart of Kreuzberg. After briefly observing a cooking video production in the company kitchen, founder Verena Hubertz shared the success story of the app with the audience. Following a sightseeing tour at the East Side Gallery, the Safari bus arrived at the office of mobile adtech company YOC in Prenzlauer Berg. We were met by Jan Gräwen, YOC Managing Director, who walked us through effective mobile advertising strategies and presented award winning cases. After lunch the Safari was off again and up the stairs to the office of OneFootball, conveniently located in the same building. We were welcomed by company founder Lucas von Cranach, who recalled the company’s roots and rise to become the leading football app globally. Today OneFootball spurs the passion of more than 20 million football fans in more than 200 countries with live scores, news, statistics, videos and live audio broadcasts from 140 leagues in 16 languages. Next stop was Telefónica Next, located in the Rocket Tower in Berlin Mitte. The entrepreneurial spin-off of Telefónica Germany is best known for innovations in the areas of Big Data, audience targeting and the Internet of Things (IoT). Lukasz Wojtusiak, Leader Products and Innovation @ Minodes, a Telefónica NEXT company, gave a talk about location data and in-store analytics, delving into what retailers need to do in order to gain deeper insights into consumer behavior and — ultimately — drive customer engagement. From there the Safari made the trek to the Backfabrik, the hub that is home to more than 35 startups. The Safari group had the chance to learn more about Lovoo, a leading dating and social entertainment app that counts over 70 million users worldwide. Thomas Reuser, Head of Advertising at Lovoo, talked about the massive new opportunities offered by mobile video and concluded his session with an interactive quiz game. Last on the agenda was a visit to adsquare, a real-time Mobile Data Exchange that brings together advertisers and data providers in a secure and privacy-friendly way. The Safari group was greeted by Luise Weiß, Director Sales DACH, who talked about the hot topic of data quality and shared best practices with the audience. After an intense day rich in variety and an invigorating exchange, adsquare invited us to chill with cold drinks, created by a mixologist, finger food and music. This final stop rounded out a perfect balance of work and pleasure, offering our explorers the chance to connect and network with cutting-edge innovators in a casual atmosphere. We’ll be back next year with another Mobile Safari, offering a select group of guests the unique opportunity to learn valuable practices, view the latest mobile developments and explore solutions for marketers and businesses.